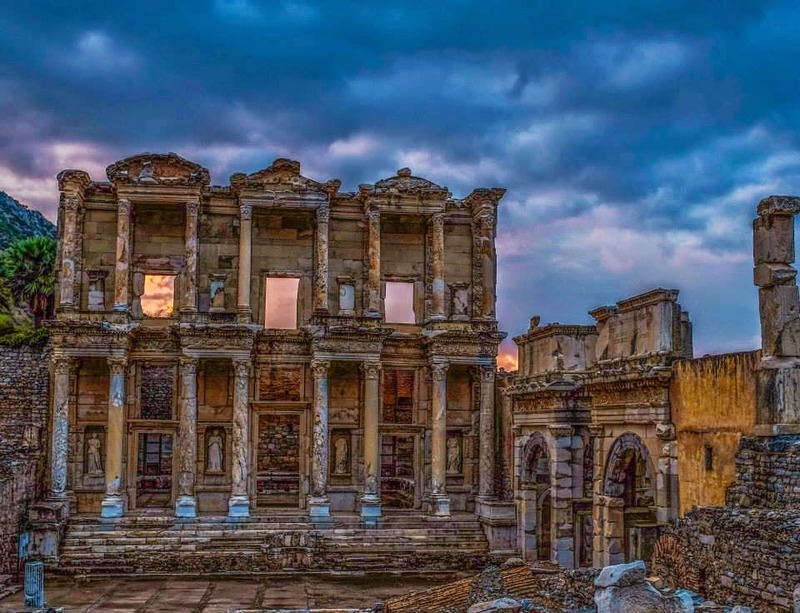 Ephesus is an ancient Greek city, located in present day Turkey. 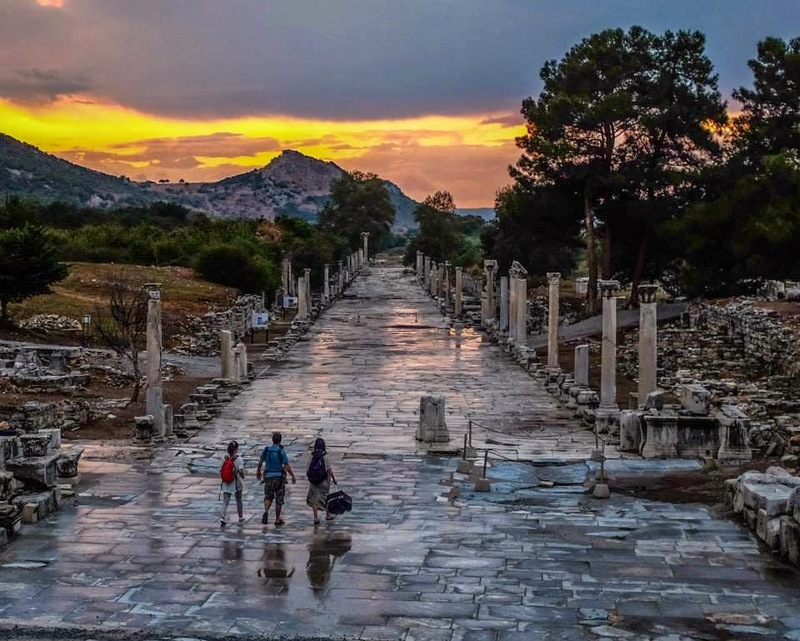 Beginning in AD 50, Ephesus was an important center for Christianity. It is estimated that as many as 56,000 people lived within the city during the height of the Roman Empire, 180 years earlier. As you can imagine, there is an abundance of history in the ruins at Ephesus. We spent an afternoon visiting the ruins. Though my knowledge of and interest in the specifics of the history of the ruins is scant, I very much enjoyed seeing the ruins. ...and the endless rows of "pieces" just waiting to be matched with their long-lost brethren. such as this acoustically impressive theatre (ca 200 BC). And this, my friends, is said to be the oldest advertisement for prostitution. and the foot on the left tells customers how to navigate towards the cat house. who live amongst the ruins. Now for the people photos. Here is me and the family of Feridun (Ferit's brother), jumping for joy. Feridun's adorable son is in the foreground. ...as well as the yoga pose. while his shadow opts to traverse the puddle. This is the Celsus Library, constructed in 135 AD. ...I love the simplicity of this column. who needs to do their business. Late in the afternoon, it started to rain. but we didn't let the moisture deter our sightseeing. Fortunately, my non-waterproof backpack fit nicely beneath my rain jacket. they were hungry for affection. And here's another photo of kitties receiving some kitty love. but I desperately miss my kitties. ...very much enjoying each other's company. The combination of the rain along with a gorgeous sunset made for some spectacular photos. Here are some of my favorite photos from the day, all taken by my favorite photographer, Ferit. A girl and her umbrella. Feridun's family looks as though they are the last survivors on a nearly-destructed planet. Very interesting pics at the ruins, Sarah! I'd like to go there sometime, too. Your JOY is infectious! Keep those pics coming! Great call on the zooming of the library. It is a huge jig saw puzzle! Love it. And since tonight is walking dead night love the post apocalyptic shot! Which character am I playing at walking dead scene??! !